If you’ve spent some time in downtown Austin, you’ve probably encountered people exploring the city on Segways. Maybe you’ve even taken a tour yourself! These “self-balancing” electric vehicles remain one of the most popular tools for urban explorers, since you can cover a lot of ground without needing to walk everywhere, getting on and off a bus, or in and out of car. Not surprisingly, several companies in Austin offer Segways for rent and guided tour packages. 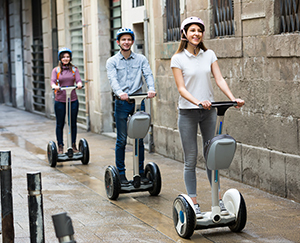 Unfortunately, Segway injuries—including injuries to the feet and ankles—are more common than you might think. Despite all the high-tech sensors and computer technology designed to keep the machine upright, a lot can still go wrong. Driver error, unexpected bumps in the road, and just plain lack of balance can lead to an unexpected tumble. Perhaps the most common Segway injury we see is the ankle sprain. It’s not hard to see why: sprains are often the consequence of an awkward fall that stretches ligaments on the front or side of the joint beyond what they can bear. Even from the moderate height of a Segway, just a few inches above the ground, the force of your body weight crashing down on a twisted ankle can do serious damage. Another injury you might not suspect to be Segway-related? Stress fractures. In order to move forward on a Segway, the operator must shift their weight forward on the platform, toward the front of their feet. This puts a lot of strain on the metatarsal bones, which don’t usually have to bear the full force of your weight for extended periods of time. If you do a lot of Segway riding, over time this may lead to tiny cracks forming in those bones. There’s no question Segways can be a lot of fun, but always remember to ride safely! Wear a helmet, stay alert, and if you experience any foot pain, make an appointment to see the Austin Foot and Ankle Specialists at one of our three convenient locations. You can request one online, or give us a call at (512) 328-8900.